Michael Giacchino: From Star Tours To Jurassic World | Warped Factor - Words in the Key of Geek. 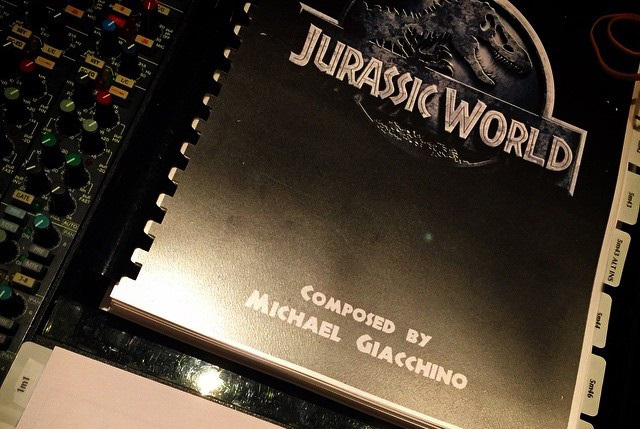 With Jurassic World opening in cinemas this week, Christopher Morley looks at the work of the man stepping into John Williams shoes - Composer Michael Giacchino. While composer Michael Giacchino's stock continues to rise, with critically acclaimed work on the likes of Alias, Lost, The Incredibles, Up and Star Trek, you could forgive him a little trepidation at going where no man has gone before & in a sense stepping into the shoes of John Williams as he prepares to score Jurassic World! The legendary 83 year old composer has proved himself no slouch well into his dotage- having of course worked with Steven Spielberg to bring us the original Jurassic Park trilogy, ET, Schindler's List, Jaws and of course the Indiana Jones series. And it would be a glaring omission indeed should we forget to mention his collaborations with Spielberg's close friend George Lucas on the likes of Star Wars. Giacchino has of course enjoyed a similarly fruitful partnership with JJ Abrams........as noted by the Huffington Post. "When we first met we became very fast friends because we had a very similar background with regard to our love of film-making. It was nice because there was never a need to feel like you couldn't say you didn't like something. He could always tell me if I did something that he thought could be better, and vice versa." But surely Giacchino can't have failed to learn from his musical forebear, with Williams' music seemingly embedded in the public consciousness? Throw in the fact that one of his first projects having started out composing for video games was the pixellated tie-in to The Lost World and there's a sense that they might just have picked the right man for the job. "I was instantly sort of terrified and was questioning my sanity for even saying yes to it, but my excitement for working with [director Colin Trevorrow] and working on a Jurassic movie after so many years sort of overtook that [fear] and got the better of me." Reassurance came in the knowledge that he had a famous fan! "John has been incredibly wonderful to me over the years and very supportive—always there to say ‘Hey, I loved what you did on this film, great job. He’s been so much a part of me growing and learning in this business, so it was all the more important to me to make sure that what we did with his music was right for the film and for the fans and for the people who love Jurassic Park." "In our initial conversations, Colin and I talked about where are we going to put John Williams’ theme because we both love that music so much and that music, to me,is Jurassic Park. There was no way to do the movie without that somewhere." The interplay between the two doesn't end there either, extending to a galaxy far away. With Abrams poised to direct December's first post- Return Of The Jedi Star Wars outing, early speculation was that Giacchino would be asked to provide the soundtrack. But he himself suggested that Williams should be allowed to return! "One of the things that excites me most about 'Star Wars' coming back is chance to hear a John Williams score. If it were up to me I would say 'John, you must do it.'" "Michael Giacchino is an incredible composer, who I was lucky enough to begin working with on Alias. He's truly one of the most influential members of our crew, and I think [on] this score (for Star Trek-Into Darkness), he really outdid himself. Again, for Star Wars, it's very early days, but I believe that, going forward, John Williams will be doing that film, because he was there long before I was." Giacchino has in a sense worked in the musical universe of Star Wars already! Disneyland's Star Tours gave him the opportunity to get to the bottom of a long-held curiosity, as he told Endor Express. "I listened to it incessantly, every kind of music imaginable I listened to. I was always just very curious. In fact, it was Star Wars. I remember reading the liner notes in the album when it said “the French Horns are playing Luke’s theme here” and I thought to myself “Oh my God, that’s what that was called”. It was like looking under the hood at an engine and going “Oh that’s how this works!” and I remember that day I was sitting at home with my headphones and I had this revelation of what was going on. Before that, I was just listening, not understanding what everything was and why. With those liner notes, it gave me insight into what was really going on with the orchestra. And from that day on I was obsessed with what instrument was doing what.I recall reading the very same liner notes and it too fascinated me and got me more into music. It’s also amazing to me that growing up, I would be watching these films going “Oh, I really like that score” and it would almost always be a John Williams score." That admiration would show in his work composing for the Tours. They said that they’d actually like me to write new music for it and I asked, “What do you mean new music?” They replied “We’d like new themes.” I said “You can’t do that!”And I’m a massive Star Wars fan so you have to use the music from the movies. Think of it this way, I’m a huge Star Wars fan and if I walked in there and heard anyone’s music that wasn’t John Williams, I wouldn’t be happy about that. I’d be pretty disappointed. I said “If you want me to produce this and let me be involved using John’s music, I would love to do that.” So we went that route and it was great because I got to sit down with John Williams and go over all of his music. We talked about it and what we wanted to do." A conversation worth having, clearly, with plenty of back & forth!